Experience fear at a whole new level. 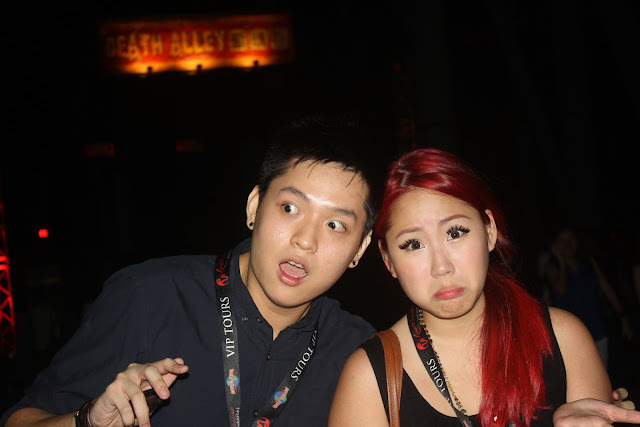 When the invite for Halloween Horror Nights 2 came in, i knew i couldn't miss this one. Universal Studios Singapore never disappoints, whether it is their VIP tour, or any other event. 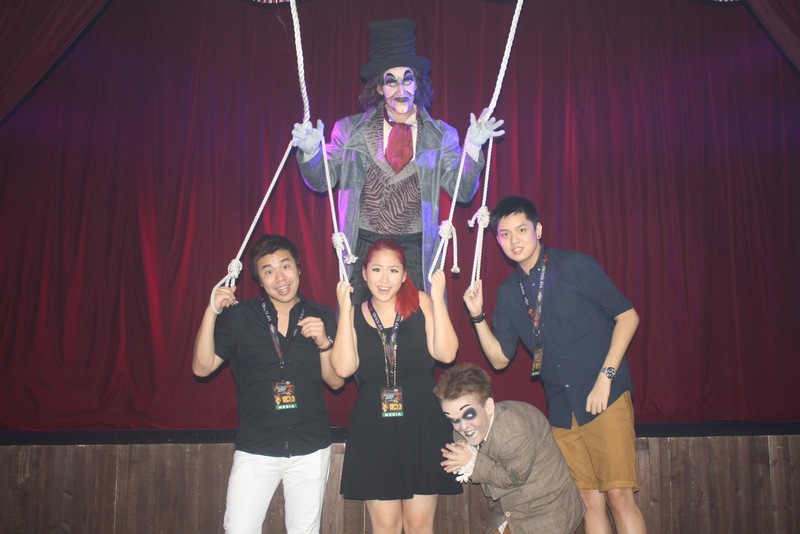 It was opening night at Universal Studios Singapore, Halloween Horror Nights 2. At 7.30pm, the first gate opened, and thousands of people eagerly waited to see what was in store for them. When the clock stroke 8pm, you could see that grin on the faces of kids, adults, as well as elderly people. Featuring many scare zones and THREE haunted houses, just in case one isn't enough to run the chill down your spine, the park has more than 400 scare actors walking around just to make the atmosphere better. My favorite scare zones will have to be Total Knockdown and Bizzare Bazaar, both of which i think took a lot of effort to put together in order to give that extra impact when people are walking through. Also, upon entering, you will be greeted by House of Dolls, which is actually as creepy as it sounds. Do not get confused by scare zones and haunted houses. Haunted houses are haunted houses and not scare zones. The three haunted houses (The Insanitarium, Death Alley and Dungeon of Damnation) each features a different theme. I personally think you should go for Dungeon of Damnation, which has pretty cool effects that's bound to inject at least some fear into you, as well as The Insanitarium, which is themed to be a mental asylum. And if you think you might need to back out halfway through the haunted houses, you will be glad to know that they have position quite a few staff inside the houses in case of an emergency. Fret not if you think the scare actors are only out to scare you, because they do pose for photos if you ask nicely, or if you can bring yourself to stand beside them. With so many scare actors with such realistic make-up and appearances, you are bound to find at least one you like! I love the props that looked so real i really couldn't distinguish whether some props were real people or not. Just a note, flash photography isn't allowed in the haunted houses, so if you are thinking of lugging your bulky cameras i recommend you not to. Skip the photography for once and just enjoy yourself with all the screaming and running around. If haunted houses and scary props aren't your kind of things, you'll also be glad to know all major rides will also be in operation. This includes the 2 roller coasters, the indoor roller coaster, as well as a few other rides! I went on Cylon and Human, Transformers, as well as Revenge of the Mummy! The park opens from 8pm till 12am, which gives you ample time to go for the haunted houses, as well as some rides. Tickets are priced at SGD 68 for ordinary entry, or you have the option to top up SGD 40 to get an express pass. I highly recommend this because the feeling of not having to queue is simply amazing, and it also gives you more time to check out other stuff! 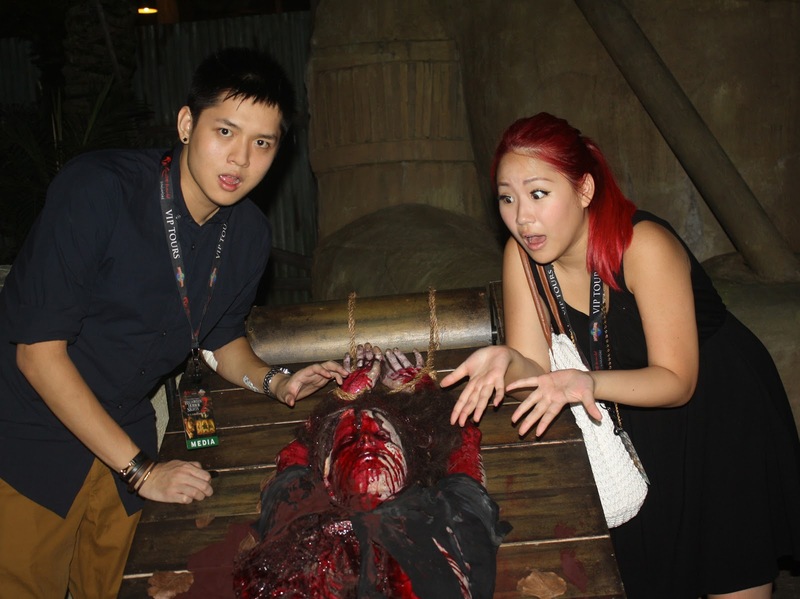 Halloween Horror Nights 2 runs from 19 October - 21 October, as well as 25 October - 28 October 2012. I reckon Halloween this year will not be complete unless you experience this.